VIDEO: Voting Rights: The why of Suffrage Wagon Cooking School on Vimeo. HAPPY LABOR DAY WEEKEND with a special message from Marguerite Kearns and best wishes for all the harvesting and fun the weekend involves. At Suffrage Wagon Cooking School there is a close connection to the seasons. Visit your area farmers’ market to support local produce and enjoy the cooking and baking that goes along with it. Filmmaker Ken Burns has set up a digital presence highlighting many of those individuals he has featured in well-known documentaries over the years. pbs.org/kenburns/unum highlights the Ken Burns documentary on Elizabeth Cady Stanton and Susan B. Anthony (“Not for Ourselves Alone”) that has opened the door to many other productions. Womensenews is conducting a campaign to make sure the voter base is registered. It is called “3forV” or “Will you ask Three People a Day if they are registered to vote?” Graphic from WomenseNews. Thank you. The revived campaign for the Equal Rights Amendment to the US Constitution continues. 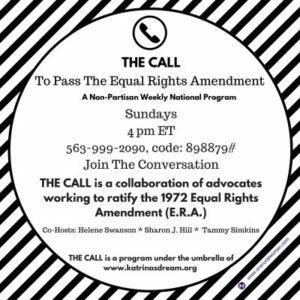 There’s a national non-partisan weekly national program featuring a collaboration of advocates working to ratify the 1972 Equal Rights Amendment (ERA). US women have been working to get the Equal Rights Amendment included in the Constitution since 1923.